In Colorado, arrests for Hispanic growers have increased 38% between 2012 and 2014 (see chart on page 103 of this document). 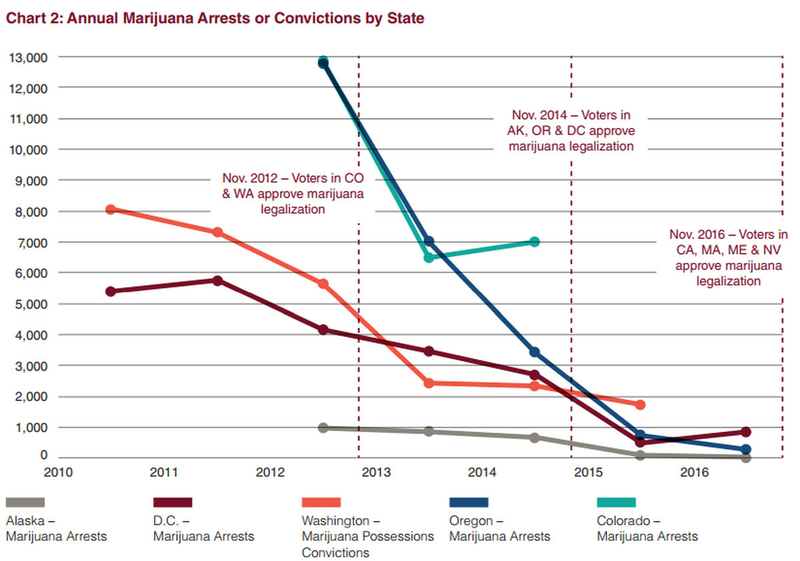 Arrest rates have increased for black growers and dealers in Alaska and Washington State and Washington DC between 2015 and 2016 post-legalization (see charts in link below). 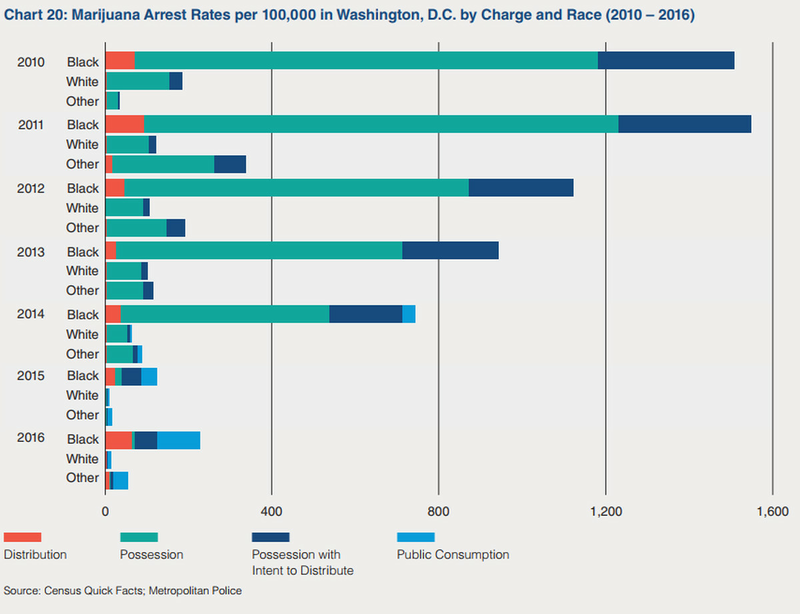 Both groups saw big drops in marijuana arrests, but large racial disparities remain. Marijuana legalization does a lot of things, but one thing it doesn’t do is stop racial disparities in the criminal justice system — even with marijuana arrests. In a recent report by the Drug Policy Alliance, the pro-legalization group documented the effects of marijuana legalization in several states. As expected, marijuana arrests are down dramatically in legal pot states. But arrests remain for, say, possession by people who are under the legal age of 21, unlicensed sales, and public consumption. Things get a little more complicated, though, when you break the data down by race. Arrests have declined for all racial groups since legalization. But that hasn’t halted racial disparities. Both black and white people are much less likely to be arrested over marijuana, but black people are still much more likely to be arrested for pot in comparison to white people. This is still progress for marijuana legalization advocates, since fewer people of all races are arrested for cannabis in the end. But the findings also show the persistence of racial disparities in the criminal justice system. The disparities are not explained by differences in black and white marijuana use rates. Surveys show black and white Americans use cannabis at similar levels. Instead, there seems to be some level of bias built into the criminal justice system. Perhaps it’s individual racial biases among police officers. Maybe it’s how police are disproportionately deployed in minority communities, purportedly because they have higher levels of crime. Then there are socioeconomic disparities that may drive some groups to, for example, more frequently use and sell drugs outdoors instead of indoors. All of these factors and others are likely working together to maintain racial disparities in the criminal justice system. legalization, but subtly increased in 2016. 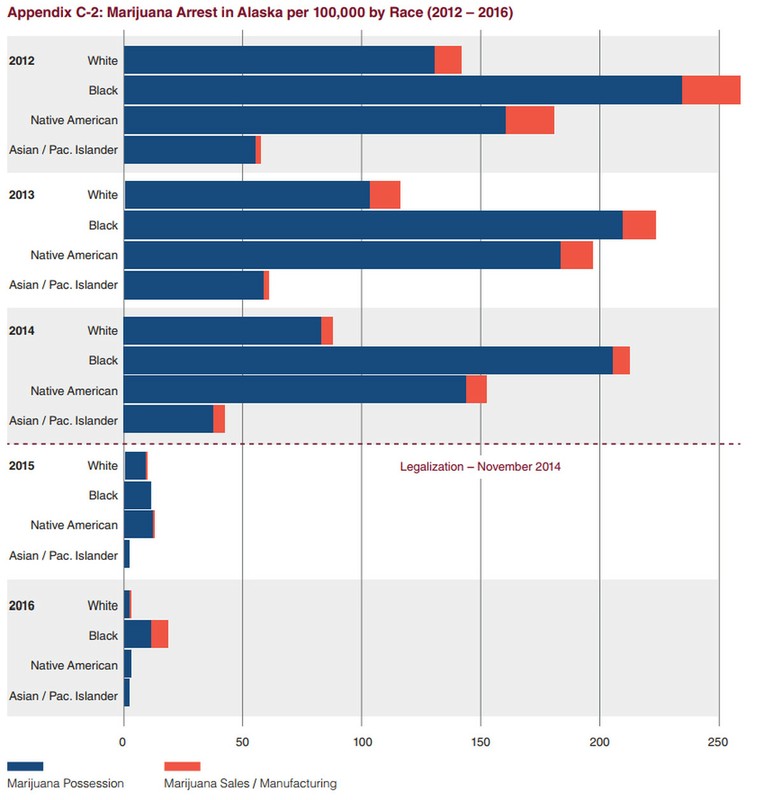 Arrests in D.C.
disproportionately impacted Black men (see Chart 18 below). Unfortunately, unlike the United States and United Kingdom, Canada does not systematically collect or publish racially-disaggregated data on its criminal justice system. We therefore know little about racial differences in who is arrested, convicted or incarcerated for drug-related offences. The limited data that are available have been obtained by journalists through freedom of information requests, as was the case in this week’s VICE News investigation. But even though far fewer black people are being arrested, the racial gap is now a bit worse. In a forthcoming report, the center finds that black people were twice as likely to be arrested for pot crimes in 2016 as other groups — and that’s actually up from the year before a recreational market was created here for marijuana. Who still pays the price for marijuana crimes now that pot’s legal?